These are the times where you don’t hear from the defenders of the WBA, WBO, WBF and IBF belts who somehow think they’re good for boxing: when we get a mismatch nobody else but one of the alphabets wanted, asked for, or expected to be remotely competitive. 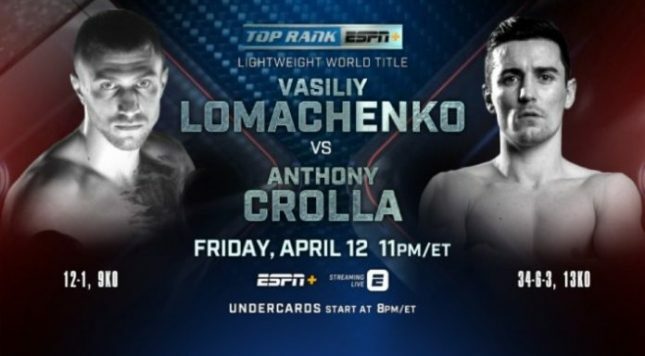 Vasiliy Lomachenko crumpled his lightweight mandatory challenger Anthony Crolla Saturday on ESPN+ in the 4th round after three rounds where Crolla barely landed a punch against the best pound-for-pound fighter in the world. This fight gave us two things, total. The first is that we got to see that Lomachenko’s right arm, after a torn labrum two fights ago, looks healthy. It didn’t in his last fight. With health, Loma is back to the total package: offense, defense, quickness, power, intelligence. His offense was incomplete last time. The second thing is related, which is that the fight gave us a crushing finale. It was a compact right hook whereby Loma completed the sacrifice, one that landed smack dab on Crolla’s temple and sent him toppling face first, his arms and legs folded beneath him. It seemed to some of us, including Loma, that the fight had ended earlier, when a Loma salvo along the ropes in the 3rd prompted the ref to step in, but he wasn’t stopping it and rather calling a knockdown. When not even the boxing promoters who have made their living off the short-term profit of hyping belt fights — while simultaneously undercutting the broader audience that finds them confusing and meaningless — will defend match-ups like this, you know things are bad. Loma says he wants Mikey Garcia next. Boxing being boxing, this is the fight we should’ve gotten before Garcia’s excessively brave adventure up to welterweight. It still has something going for it. Now, if it happens, and Loma wins easily, people will point to the beating Garcia took against a much larger man as the reason why. Thanks.